Kaba Simplex 5000 Series Cylindrical Mechanical Pushbutton Lock and is good for access control. This Kaba fully mechanical lock eliminates the material and labor expense of battery replacements has a single access-code and is programmed via the keypad without removing the lock from the door. Very sturdy and simple lock, however, only has one code with key over-ride. Lock cylinders from all major locks and high-security locks can be added to the lock fits into your Master key system. 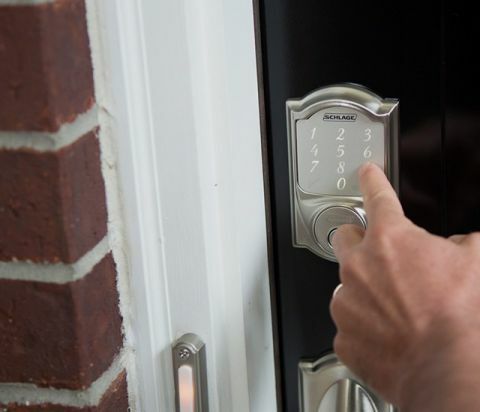 As secure as any standard deadbolt system and with the convenience and added security of not having keys to carry around, lose or have stolen. Electronic door locks are typically battery powered with a battery life of around 2 years depending on use. If the batteries run out you can always a mechanical key to allow access. Some models have an exterior 9 Volt battery hookup to allow emergency power. Most models give an audible beep before the batteries go dead allowing approximately 80 openings depending on use. Note: only use quality brand name alkaline batteries. Mr. Locksmith highly recommends Duracell batteries. One of the most versatile Electronic Commercial grade Lever Access Control Lock is the NDE wireless locks. The NDE locks can be stand-alone or integrated into popular electronic access control systems. 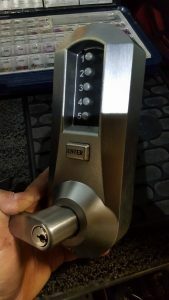 This is my go-to lock for most customers who need an access control system. Many customers start with one lock and can expand to hundreds of doors. Customers include restaurants, retail, small and large business, hospitals, schools, Airbnb, apartment buildings, the list is endless. A more robust and great Electronic locks for growing or larger facilities is the Schlage CO 200 Access Control Lock. 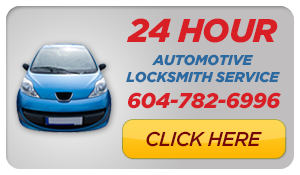 Terry Whin-Yates is the Founder, President & CEO of Mr. Locksmith Inc. and is a 3rd Generation Locksmith with over 25 years of Locksmith experience and has a BA (Honours) in Criminology from Simon Fraser University.